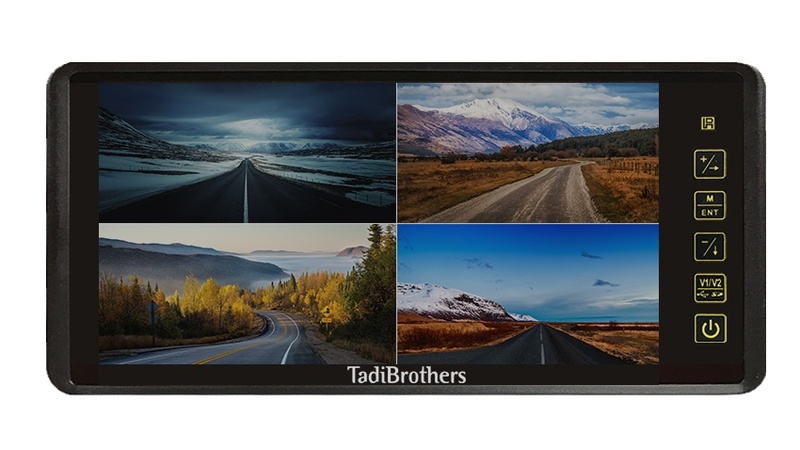 Use the Tadi Brothers 9" Split Screen Mirror to eliminate the worry of backing up your RV or large vehicle. The lightweight design clips over every standard mirror with a secure grip that won’t shift or rattle. The LCD monitor provides a crystal clear, full color view of your surroundings to assist with backing up. Four video inputs allow you to connect to multiple cameras. Just press a button to view one camera or all four on a single screen. Or use the convenient remote control, included in the package. Installation is a breeze. Just connect it up to any 12 volt power source using the 15 foot cables, included. If you’re installing it on an RV, bus, or any vehicle longer than the average SUV, we have premium extension cables that you can order through our website. An optional Adapter is included to connect with the cigarette lighter. TadiBrothers provides a full color diagram to take you through the simple steps needed. At Tadi Brothers, you never need to worry about compatibility issues. All of our cameras, monitors, and car DVD players are designed to be used together. So feel free to mix and match to create your own high-end, vehicular system. Ask us about our 4-8 camera split-screen options for security, buses, or RVs. This system, like most of our vehicular products that have an LCD screen, can also be used for video gaming. Consider that a perk for purchasing our backup system (others block that feature). At Tadi Brothers, we want you to be 100% satisfied with your purchases. We offer a 30-day guarantee to return the item for an exchange or a full refund. And our 24/7 Tech support is always here to help you out. Give us a call. We’d love to hear from you. Order your 9" Split Screen Mirror for up to 4 Backup Cameras today!